First it was the cola wars, then the beer wars, and then the burger wars (OK, maybe not exactly in that order). Now let the burrito wars begin. Taco Bell fired a salvo against Chipotle Wednesday, announcing a new “Cantina Bell” menu that seemed to take some cues from its pricier rival. The four new menu items would include ingredients new to Taco bell: Black beans, cilantro rice, citrus and herb marinated chicken, “new” guacamole, fire-roasted corn salsa, creamy cilantro dressing, and Pico de Gallo. New menu items featuring the ingredients include bowls and burritos. The company is suggesting franchises sell chicken or veggie offerings for $4.79 and $4.99 for steak. When asked if it was a challenge to Chipotle, company spokesman Rob Poetsch said it had to do with changing customer tastes. Taco Bell will have a better chance to sell up to current customers rather than take them away from Chipotle, said Darren Tristano, executive vice president of Technomic, a food industry consulting group. Taco Bell is No. 1 in the “limited service Mexican” restaurant segment which takes in $13.5 billion a year in the U.S., with 50.4 percent of the business, Tristano said. Chipotle is second with 16.4 percent. But Taco Bell has slipped about 3 percent in the last year and Chipotle has gained about the same amount. 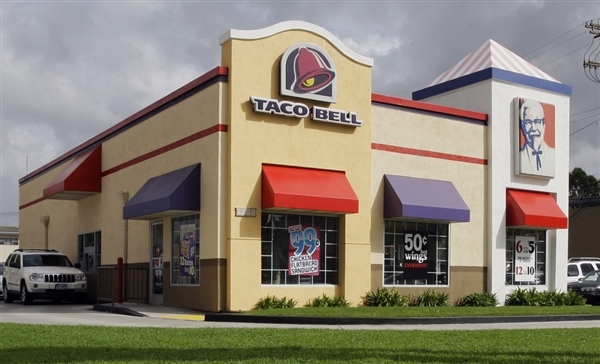 Taco Bell has about 6,000 restaurants in the U.S., Chipotle has about 1,200. A Chipotle spokesman said the company didn’t see Taco Bell’s moves as a challenge. The new items launch nationwide July 5. Poetsch said to expect more Cantina Bell items, since the category would a permanent addition. The company has been test marketing the items in Bakersfield, Calif., and Louisville, Ky., since January. Taco Bell is owned by Yum! brands, which also owns KFC and Pizza Hut. Chipotle is an independent company that received a minority investment from McDonald’s, which has since divested itself of the company. This entry was posted on Monday, July 9th, 2012 at 9:22 am and is filed under Burrito, Flavor, Franchise Activity, Future Plans/Announcements, Growth, Hispanic, Ingredient, Menu Development/Innovation, Menu Trends, New Product Tests/Mentions, Price. You can follow any responses to this entry through the RSS 2.0 feed. You can leave a response, or trackback from your own site.